So I'm an antique quilt collector. 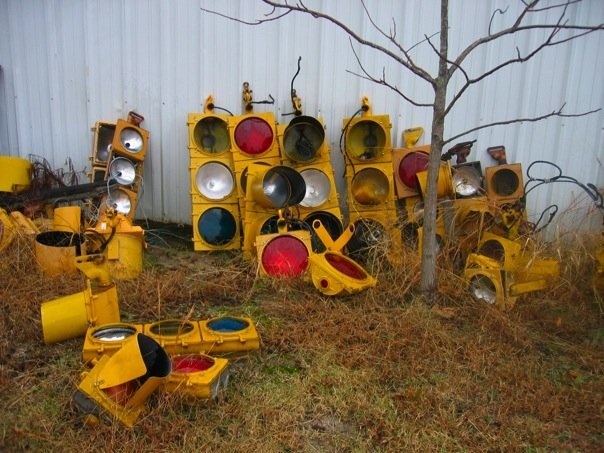 And some of my R&D involves cruising ebay and other online auctions. When I see something strange and wonderful (notice how I almost always combine those terms-) but the quilt is already too dear for me to even consider bidding, I save a picture if I can and file away in a rather large file under the heading "Interesting as seen on ebay." There will always be a few that I regret missing. So this is a roll call of the ones that got away, with an emphasis on the fan shape. Please note that I neither recorded the dates or who the seller was--all I wanted was the graphic memory of the long-gone quilt. if any of these quilts belong to you, I am more than willing to insert attribution so contact me. 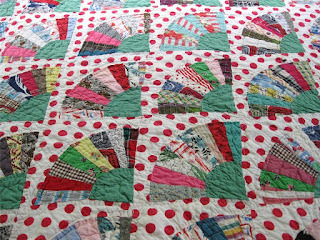 A close-up from the Polka Dot Fan quilt as seen above. It's got to be Southern. The zippy color scheme plus the slightly wonky oversize dots makes me wonder if I could be so bold in my own quiltmaking. This old beauty is a wool quilt of Mennonite origin. 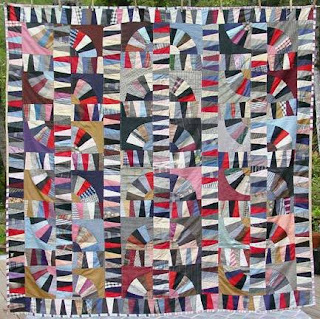 Love this dramatic pieced pattern that falls diagonally down the quilt supported by large squares of plaids and plains. I even like the picture where it's slung casually over a wire fence! And there's this killer fan quilt top I still dream about--from Missouri I think. Detail of the Killer Fan. Love the skinny red shapes that tie the fans together within the block. 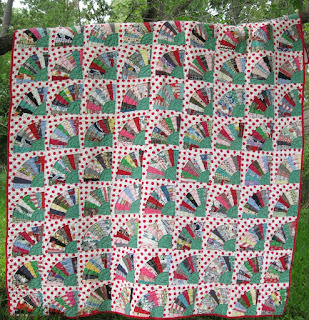 Finally a wonderful combination of a fan+crazy quilt. A one-of certainly. Oh dear--this blog has been sadly neglected! True confessions--it's way too easy to zap over to Facebook and post a few comments or pictures rather than plan and write a blog. Maybe I over-think this thing. Not like there's anything special to do in December, right? The challenge began December 1 and lasts through the last day of the year. I am obviously a day late in starting! Cheryl challenged us to blog daily but seeing as how I write three blogs, eventually I realized that once a week for each blog would be a more realistic goal. In other words, 12 new postings. That I can handle. Today on December 2, it's Quilt Flap's turn. For all lovers of antique textiles and particularly quilts, feast your eyes on this 50's House quilt. I bought it off ebay for cheap (I am cheap-) and am even more delighted when it came in the mail. The pattern is uber-simple and I love the way the roof piece seems to levitate above the main house parts. The quilt was likely made in the 1960s (looking at the prints) although the seller could tell me nothing about it. Love the orange sashing and the turquoise cornerstones! Not surprising to me that this quilt hails from Florida. Time for Another Quilt Flap! 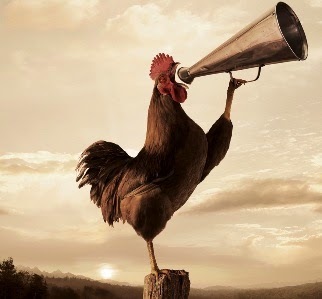 If I was a rooster, I'd crow about it! 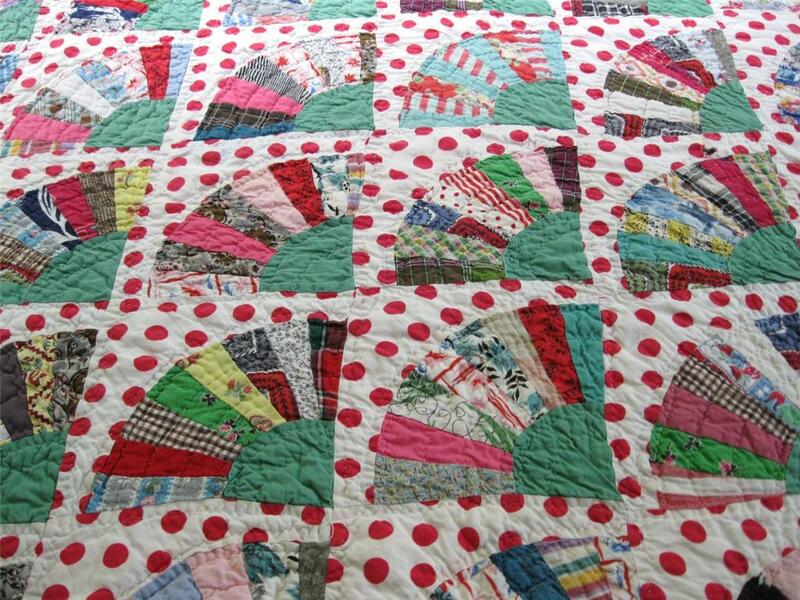 The whole reason this blog got started years ago was to showcase antique quilts and particularly those quilts unearthed through Quilt Documentation Days. A documentation day typically starts with lots of greetings and "Get yourself a cup of coffee and a doughnut-" and "Oh my-that's a big pile of quilts you have there!" 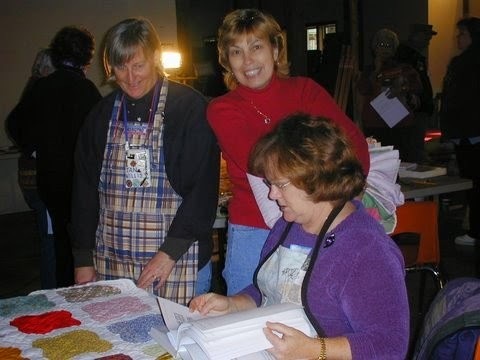 People line up with their treasures and as the volunteers hit their stride, the quilt owners move through the line and on to the documenters quickly. Some volunteers might listen intently to the quilt owner and record an oral family history about the quilt at hand. This is an important step in the documentation process. As everyday objects, made-at-home quilts are usually taken for granted and treated as insignificant detritus once the maker had passed. But in recording its story, we are reinforcing to the quilt's owner that her quilt (and the person who made it) was and is important. Often a woman's quilts, besides her children, were her most enduring physical legacy. Other volunteers are busy measuring and recording statistics such as the size of the quilt and noting its condition. Someone else has her head stuck in Brackman's Encyclopedia of Pieced Quilt Patterns trying to best name the variation of Churn Dash-Log Cabin-Grandmother's Fan that just walked in the door. Someone else is taking pictures. It is folk scholarship at its best and we love doing it here in North Carolina. 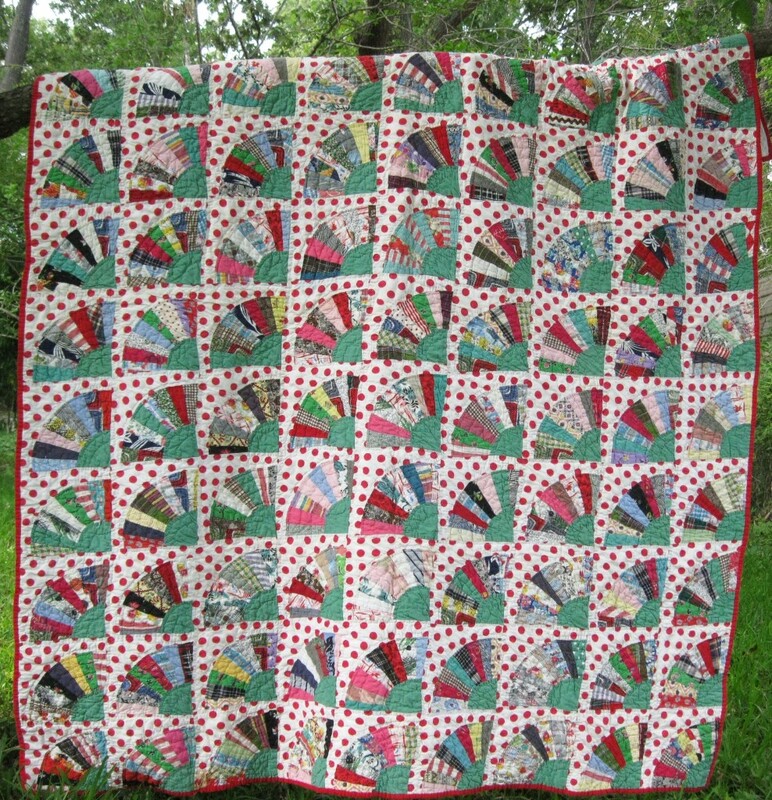 In a little less than two weeks, there will be another Quilt Flap event. It's up the road a piece from where I live but if it's near you, you are welcome to come. This event is centered in Wayne County, North Carolina and the poster follows here. 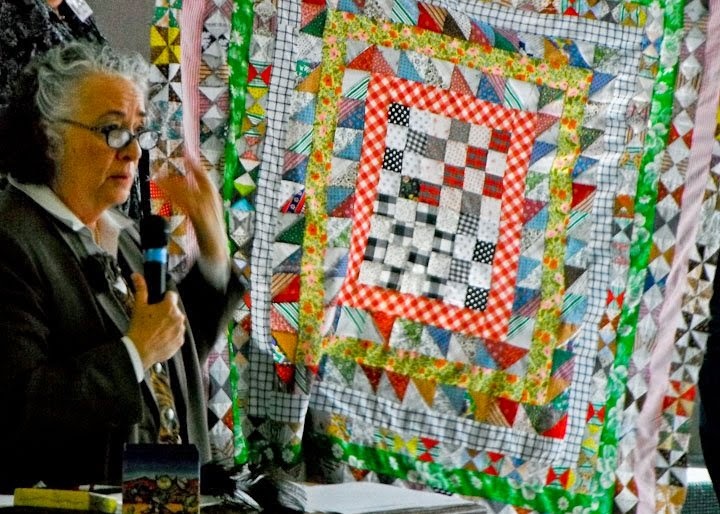 Lynn Gorges is the main speaker at this event but I get to pet all the quilts! 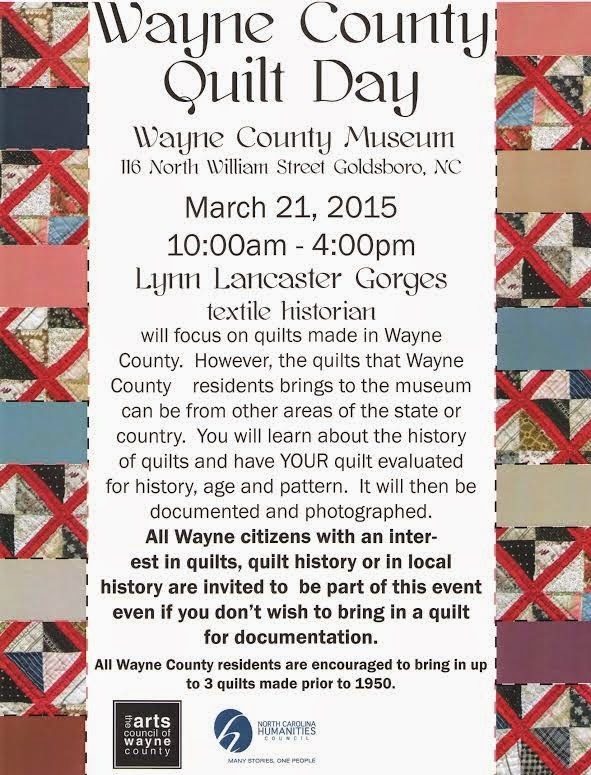 For more information, call the Wayne County Museum at (919) 734-5023. What a great way to celebrate the first full day of Spring!